From elementary Italian at Columbia to more advanced courses at Berkeley and Duke, I have frequently included film in my teaching. In the Italian Writing Workshop I use La meglio gioventù as a starting point for examinations of a range of historical and cultural Italian topics. While teaching Lessico famigliare in the Writing Workshop it became clear that some students had little knowledge of fascism or Italy’s shifting political scene during the 1940s, so I included Roma città aperta (often called Open City in English) as an entry point for this conversation, which also presented an opportunity to discuss the film’s debated neorealism. 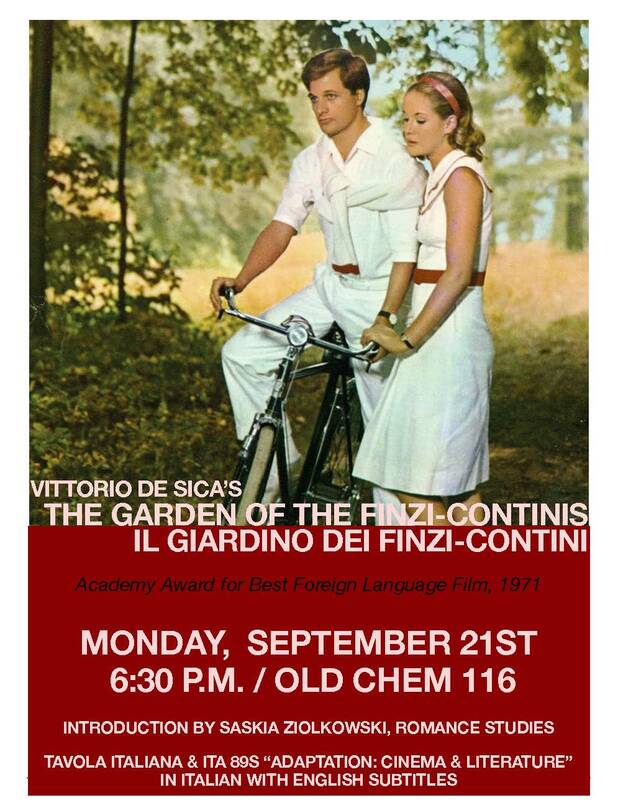 I guest lectured on this film in the Duke course “World Masterpieces Made in Italy.” At the end of the bridge course (the “Writing Workshop” or “Introduction to Italian Studies”), we watch Sorrentino’s Il divo, a film that is best understood after having gained substantial knowledge of Italy’s political and cultural contexts. While the film is fun and fast-paced and someone with little acquaintance of Italy is able to enjoy it, the film can also provide a sense of accomplishment to students who watch and comprehend more of its levels because of what they have learned. In the upper-level course “Fascism in Italian Literature and Film,” we analyzed De Sica’s The Garden of the Finzi-Continis, Rossellini’s Open City, Bernardo Bertolucci’s The Conformist, Fellini’s Amarcord, and Marco Belocchio’s Vincere, in discussions of adaptation, memory reconstruction, social identities, conformity, violence, the Resistance, the Shoah, and the complexities of cinematic and literary representation. In the independent study for graduate students, “Anni settanta: Fiction and Film” we investigated Pasolini’s Salò, Bertolucci’s Novecento, Petri’s Todo Modo, Rosi’s Cristo si è fermato a Eboli, Cavani’s Nightporter, Antonioni’s The Passenger, and Wertmüller’s Pasqualino Settebellezze in discussions of the problems of periodization, memory culture, historical engagement, the exploration of Fascism and the Holocaust, issues of gender, and how these films responded to earlier works as well as to how they responded to the events of the tumultuous decade in which they were produced. In all my teaching on film, we talk at some point about the vocabulary and tools needed to analyze film that distinguish it from other media (particularly literature since that is generally the other object of focus). While film has always been part of my teaching, I have begun to work on it in my scholarship as well. My current book project, “Kafka’s Italian Progeny,” engages several film adaptations of Kafka, particularly Lorenza Mazzetti’s K and adaptations of Kafka’s Der Verschollene (Amerika). 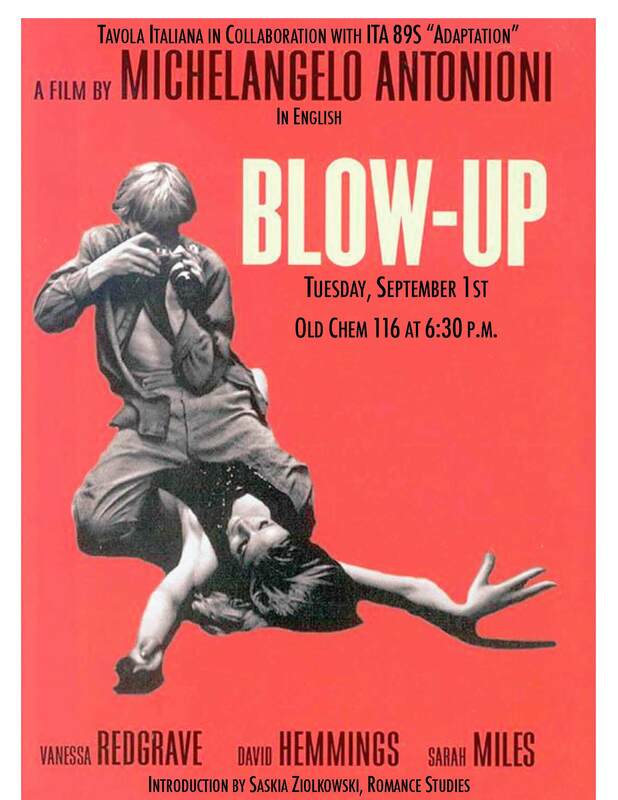 Whereas the discussion in my book relates to the significance of Amerika in the Italian literary landscape and ultimately concentrates on Kafka’s realism, Calvino, and Pavese, I am also writing an article that examines in closer detail the films (such as Fellini’s Intervista) and plays that adapt Kafka’s first novel to the screen and stage. 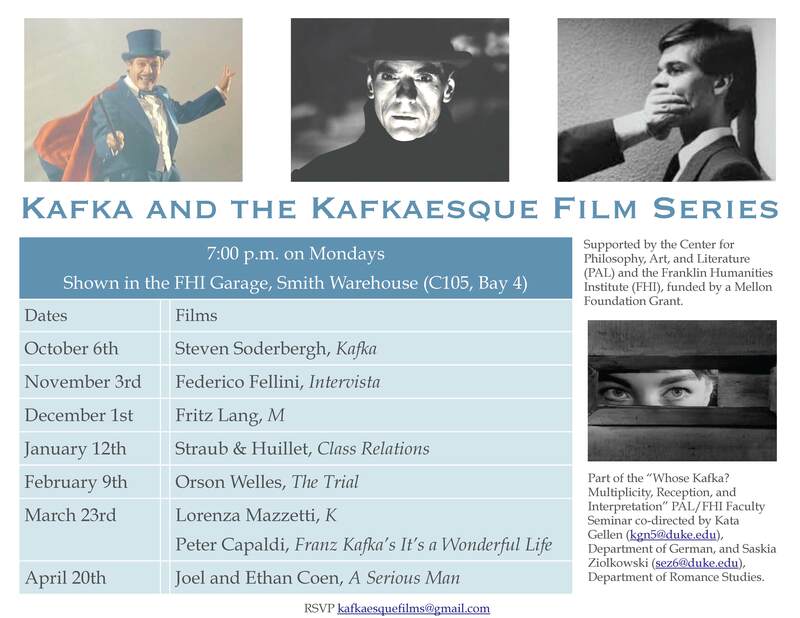 As part of the Kafka and the Kafkaesque Film Series, I introduced Fellini’s Intervista, Straub and Huillet’s Class Relations, and Mazzetti’s K.